Arcamone obtained her Juris Doctor from Thomas Jefferson School of Law and is an Associate Attorney at the Law Offices of Tess Reutzel, LC. While in law school, she interned at the office of the public defender, where she gained profound experience in criminal law. She was admitted to the State Bar of California in 2014, and subsequently moved on to practice all areas of civil litigation, including but not limited to personal injury worker's compensation, contractual law, bankruptcy, and wrongful death. It did not take Mrs. Arcamone long before she realized the family law is where her true passion lies. She has since devoted herself to exclusively practicing family law and is knowledgeable in all aspects, including child custody/visitation, child support, alimony, and domestic violence restraining orders. 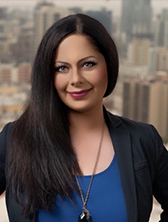 Mrs. Arcamone's varied and diverse legal background helps her to navigate this dynamic and boisterous area of law to obtain the best results for her clients. Her strong ethical approach ensures that she practices law with the utmost integrity, professionalism, and compassion.